The Mountain Valley School parent/teacher conferences are set for today and tomorrow, October 25 and 26. Parents’ visiting time with their child’s teacher(s) are available from 4 – 7 p.m. each night or schedule an appointment. It’s Parent Teacher Conference time for Mountain Valley Schools. “The teachers are excited to share data assessments, grade reports, portfolios, and information about your child,” said MVS Principal ‎Travis Garoutte. In addition, all parents who attend conferences will have the opportunity to WIN an Amazon Fire Tablet, which can be used as an educational tool at school and home. The more teachers you visit, the better the odds of winning. Each parent will receive a card to be signed by teachers. For every teacher signature a ticket will be entered in the drawing. Three tablets, (elementary, middle, and high school ) will be given away! Also, the Science Club will be having a fundraising dinner tonight, Tuesday, Oct. 25, beginning at 4 p.m. The Future Business Leaders of America will host the dinner on Wednesday, Oct. 26. Please join the school district in an educational evening and secure your chances to win a free Amazon Fire Tablet! Remember NO SCHOOL on Thursday, Oct. 27. For more information, call 719-655-2578. 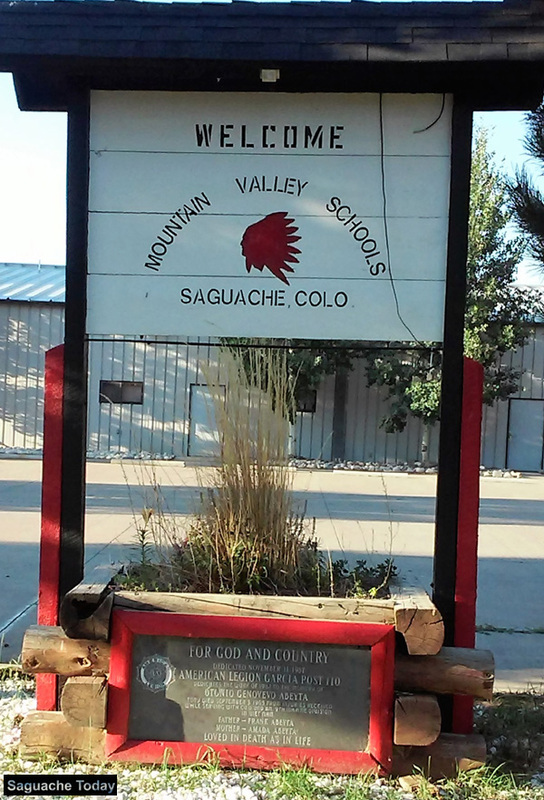 Win a Fire Tablet when you attend Parent/Teacher Conferences today and tomorrow, October 25 & 26 at Mountain Valley Schools in Saguache, Colorado. Recueda los antepasados: Remember the ancestors, the ones on their journey.On Friday, Oct. 28 there will be Mountain Valley School (MVS) student art work on display at The Range in downtown Saguache. Join the seasonal celebration of Los Dias de Los Muertos with an opening reception from 6 – 8 p.m.. Food and beverages will be served, with introductory comments and ceremony at 6 p.m.
Last year’s “Los Dias de Los Muertes” art display focused on gatherings of family and friends to pray for and remember friends and family members who have died, and help support their spiritual journey. Photo: Lynn Nowiskee/Saguache Today. Additionally, the MVS art students invite the community to contribute photographs of loved ones who have passed, special objects in remembrance of their interests, or a favoite food to share. Items can be dropped off on Friday between noon – 4 p.m. . Personal items can be retrieved at the end of the exhibition. The Range is located at 307 4th Street in downtown Saguache. The Los Dias de los Muertos will be on view through November 10. To see it for yourself, stop by, ring the bell, or call 646-734-1373 to schedule a visit. This entry was posted in Uncategorized and tagged Mountain Valley School news, Saguache, Saguache Colorado, Saguache events, Saguache news, Saguache Schools, Saguache The Range Gallery, Saguache traffic, Saguache weather, SaguacheToday.com. Bookmark the permalink.